Summer programs offer younger students the opportunity to spend time on the UC Merced campus and learn subjects ranging from leadership to science and technology. Taking part in a summer program can help students develop new skills, get hands-on experience, meet other students with similar interests and get a taste of college life. It’s also a plus on college applications — it shows that the student is committed to learning. For elementary, middle and high school students from Merced, Fresno and beyond, UC Merced has been the perfect place to participate in a variety of special summer learning opportunities. More than 100 middle school students who were part of the Brown Youth Academy slept in residence halls, learned about leadership and careers and attended a class lecture. The Willie Lewis Brown Jr. 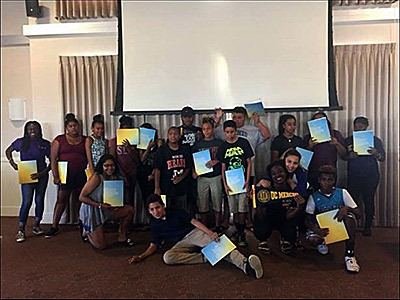 Youth Leadership Development Program, nicknamed Brown Youth Academy (BYA), is in its third summer at UC Merced. BYA serves sixth-, seventh- and eighth-grade students with an in-residence experience. “Our goal is to demystify the college experience at UC Merced and inspire students to work hard and smart so they can go to college,” program Director Mari Harris said. Seven UC Merced student leaders hosted the middle-school students who learned about leadership and careers, attended a class lecture and participated in team-building activities. They visited Yosemite National Park — most for the first time — and met UC Merced researchers. They also spent a day at nearby Lake Yosemite. Harris collaborated with schools and school districts to make the middle-school student experience at UC Merced one that is shared with families, classmates and teachers. More than 100 seventh-graders from Fresno Unified School District (FUSD) attended the program July 9-13. In addition, Merced City School District, Merced County Office of Education and Grace Hopper STEM Academy from Inglewood each sent about 60 students for the last two weeks in July. “We are proud of the work we are doing to open doors and change lives by offering this real-world opportunity at UC Merced,” Harris said. High school students in the STEP program were led on a tour of the UC Merced Vernal Pools and Grassland Reserve. About 20 students participated in the second Science and Technology Enrichment Program (STEP) hosted by the NSF CREST Center for Cellular and Biomolecular Machines, where they got research lab experience and professional development. 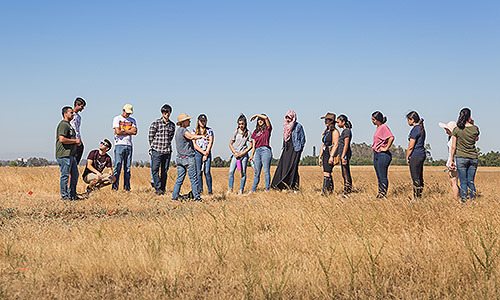 Students attended an orientation June 11-15 on campus, that included educational and research activities, campus lab tours, workshops and a walk to the UC Merced Vernal Pools and Grassland Reserve to learn about the Reserve's unique vernal pool and grassland ecosystems. The students continued individual research experiences throughout summer. STEP participants are invited back to campus to present their research at a poster session from 4-6 p.m. Oct. 22. For more information, contact Carrie Kouadio at ckouadio@ucmerced.edu. The campus’s CalTeach program partnered with UC Merced faculty, postdocs, graduate and undergraduate students to offer the 2018 Bobcat Summer STEM Academy to fifth- through 12th-grade students interested in science, technology, engineering and math (STEM) education. This summer’s workshops ranged from students learning computer aided design (CAD) software to create their own engineering projects to exploring the world of forensics by learning crime scene analysis, fingerprinting and more. Our goal is to demystify the college experience at UC Merced and inspire students to work hard and smart so they can go to college. Since 2014, the Merced County Office of Education’s SWEET Summer Academy has partnered with area communities to offer a summer engineering program that exposes students to the many different disciplines within engineering, such as bioengineering, electrical engineering and mechanical engineering. 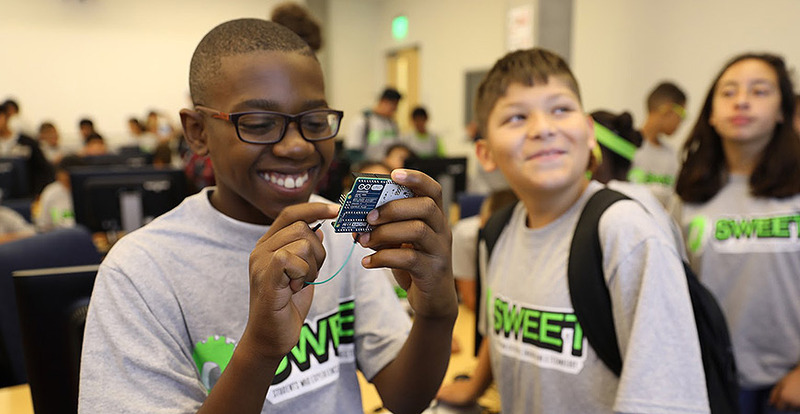 SWEET — which stands for Students Who Experience Engineering and Technology Summer Academy — is a four- to five-week program that teaches students about engineering through weekly hands-on projects. Throughout the summer, UC Merced engineering students visited participating Merced area schools and taught the Engineering is Elementary curriculum. On June 18, more than 200 students from six school districts took a tour of campus and attended lectures with guest speakers including UC Merced chemistry Professor Erik Menke.